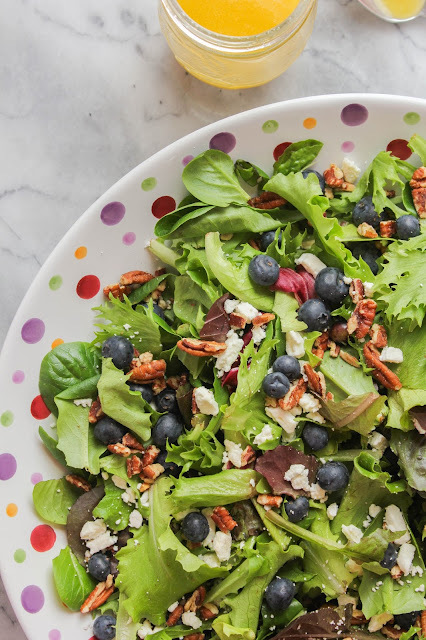 Fresh blueberries, toasted pecans, and salty feta cheese are the perfect mix of ingredients to top this mixed greens salad. The light and lively orange vinaigrette is like the icing on the cake! I love a good salad, especially this time of year when fresh fruits and veggies are becoming abundant. Blueberries are a favorite around my house, whether baked into a dessert, on top of a yogurt parfait, or just eaten by the handful, the kids and I sure do go through a lot of them! I eat salads often but am always trying to change things up a bit so they don't get boring. Adding fresh fruit is a great way to perk up your salad and give it tons of flavor. 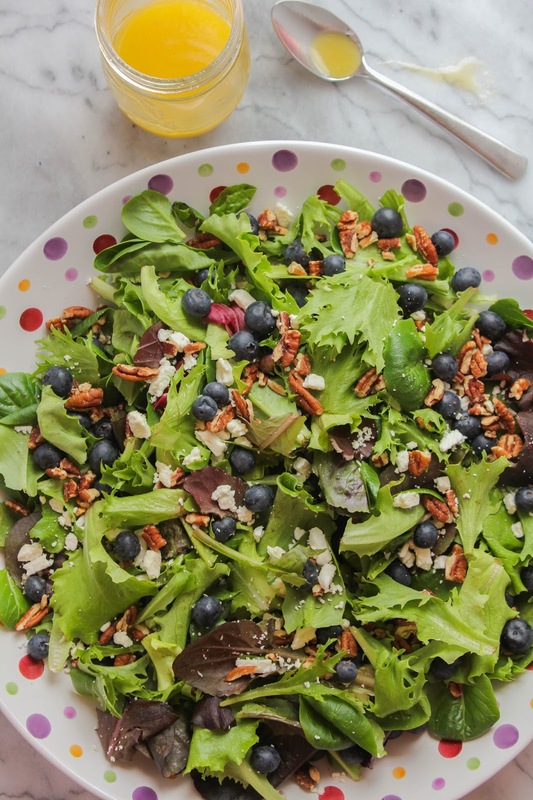 This Blueberry & Toasted Pecan Mixed Greens Salad with Orange Vinaigrette has quickly become one of my new favorite salads, and I'm pretty sure I ate it 5 days in a row for lunch! 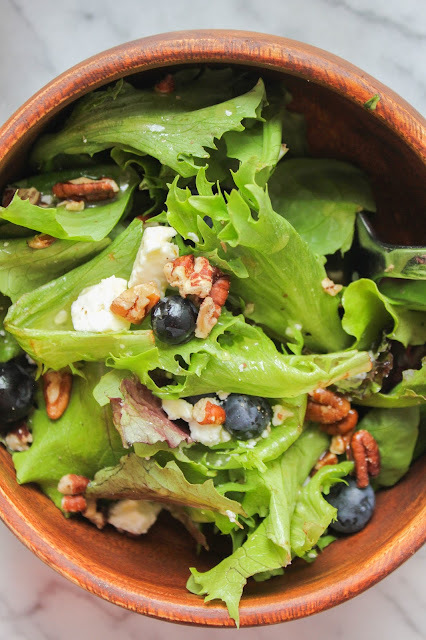 You get a crunch from the toasted pecans, a little salty bite from the feta, a sweetness from the blueberries, and then there's the vinaigrette. Oh yes, this orange vinaigrette is amazing! I can see it being a staple in my frig all year long. So I shared with you a week or so ago that I'm headed to my first ever Food Wine Conference in Orlando in May. I am SO excited! The conference is two weeks from tomorrow and I can hardly wait. 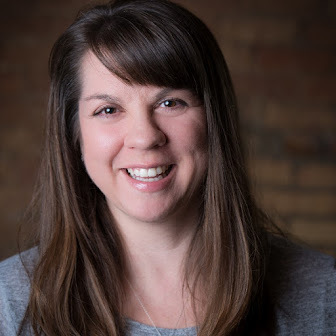 There will be sessions on business etiquette and professional presence, everything you need to know for interviews and TV appearances, producing videos, and food styling and photography, and so much more. 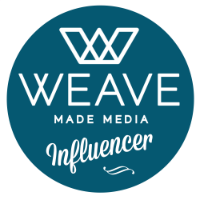 You can read all about the speakers and sessions and find out how to register here! 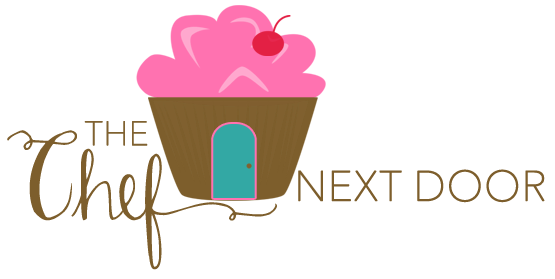 Prior to the conference one of our sponsors, Wish Farms, is having a "A Blueberry Toss" recipe contest! 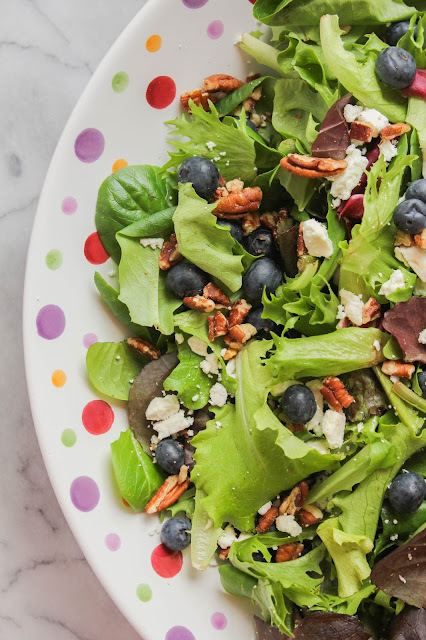 Bloggers were asked to develop an original salad recipe that includes at least one serving of fresh blueberries, and my salad fit the bill! I hope you'll give this simple salad a try and let me know what you think. I know I'll be making it all spring and summer long! First make the dressing. Combine all of the ingredients in a mason jar or other jar with a tight fitting lid, close the lid tightly, and shake vigorously until well combined. Set aside. Add the mixed greens to a large serving bowl. Add about half of the blueberries, pecans and feta cheese and toss gently. Top the salad with the remaining ingredients. Pour half of the dressing over the salad and mix gently. Add more dressing as needed.